How do women change the world? 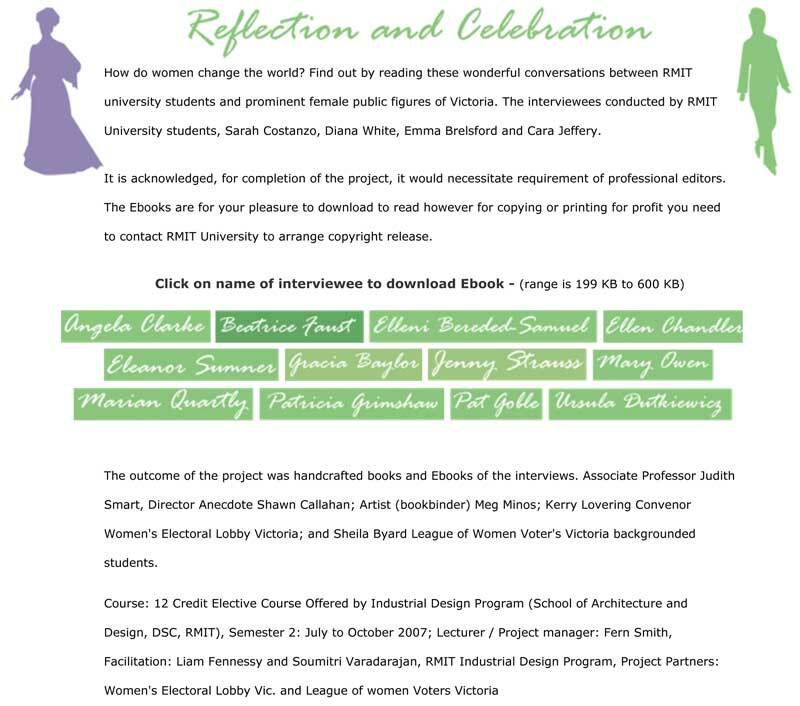 Find out by e-reading these wonderful conversations between RMIT university students and prominent female public figures of Victoria. The interviewees conducted by RMIT University students, Sarah Costanzo, Diana White, Emma Brelsford and Cara Jeffery. Angela Clarke, Beatrice Faust, Elleni Bereded Samuel, Ellen Chandler, Gracia Baylor, Jenny Strauss, Mary Owen, Marion Quartly, Patricia Grimshaw, Pat Goble, Ursula Dutkiewicz . The outcome of the project was 30 handcrafted books and Ebooks of the interviews. Students presenting at four events 2007-2008. The students were backgrounded by Associate Professor Judith Smart, Director Anecdote Shawn Callahan; Artist (bookbinder) Meg Minos; Kerry Lovering Convenor Women’s Electoral Lobby Victoria; and Sheila Byard League of Women Voter’s Victoria.